Canadian comic artist Jenn St-Onge has made a name for herself bringing beloved classic characters into the modern age. Canadian comic artist Jenn St-Onge has made a name for herself bringing beloved classic characters into the modern age. With Jem and the Holograms and The Misfits and Nancy Drew now under her belt, St-Onge is poised to take over the world. 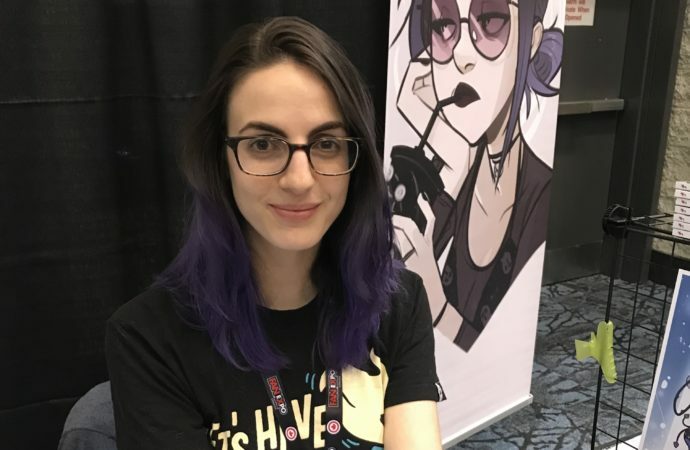 We caught up with St-Onge at the Fan Expo Canada to find out about her artistic process, what it was like working on everyone’s favourite childhood characters and what she has planned next. 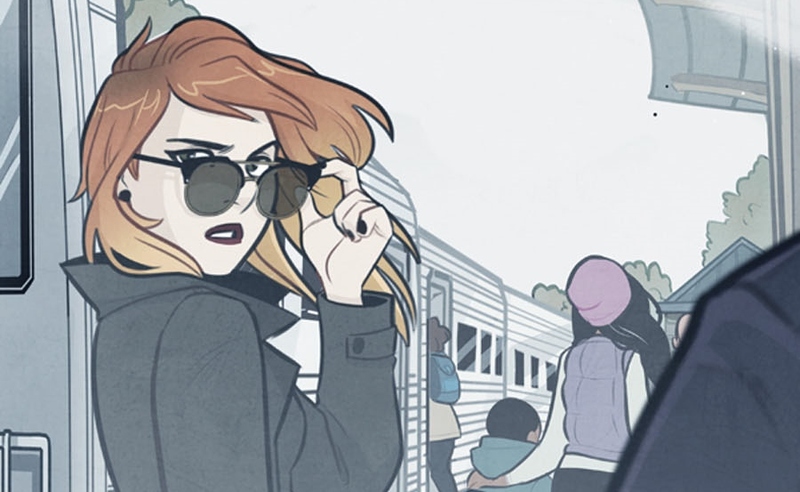 Can you share a little about the experience of bringing Nancy Drew into the world of comics? I had a lot of fun doing it! It’s a character I’ve known since I was young. She’s kind of a product of her time, whatever era she’s been in, but she’s always been very plucky and smart. There weren’t female characters solving mysteries, doing stuff for themselves, doing stuff that wasn’t boy-related. To me, this is a character who works really well for being updated for whatever year its being made into. You’ve also worked on issues of Jem and the Holograms and The Misfits, another childhood favourite for so many around the world. What was it like reimagining those characters? I was a little bit young for the original enjoyment of Jem. But, I watched it on Netflix a few years ago and I already knew what it was, obviously. Everyone knows what Jem is. I saw the IDW comic and—this was back when I was a little baby comic artist getting my start, and I was just like, “I wanna work on that. That’s something I wanna do!” And a year later, I got to do The Misfits and I did Infinite. That was just really fun because Sophie Campbell did such cool designs for them. So again, I was kinda doing fan art. I was still incorporating a little bit of my own taste into it but I wasn’t starting completely from the ground up. What was your process for learning to draw something that was completely out of your comfort zone? Not being allowed to not do it is one. I didn’t have a choice; I had to draw what I was told. And, honestly, using a lot of reference. I know that some people are a little bit like, don’t use references, it’s cheating. But the reality is that as soon as you stop looking at something, you don’t know what it looks like anymore. It’s not a bad thing for an artist to be working closely with reference to be like, how does this look? I’d never drawn instruments or cars. And I had to do a lot of that for the [Jem] comics. So yeah, I had to learn fast. I actually used, for my cars, more tricky stuff, a 3D modeler site. I said, one day, to my husband, I wish I could pick this up and look at it. How can I see what it looks like? Then we found these sites and I was like, look at this, this is super useful! That’s the best reference that I could have found. The comics you have worked on have included a number of body-positive characters, which is still a rarity in comics. How empowering is it to give readers characters that they can relate to? I honestly feel with Jem, Sophie and Kelly [Thompson], the writer, were both very [adamant]: we want Stormer to be a plus-sized girl. We want them to look really different because, in the show, it was to sell dolls, so they all looked the same. I feel like that’s part of why I got the job, because I was already doing these drawings of different body types. That was part of why I liked the comic, that was part of why I wanted to work on it. So, it was pretty cool to just go and draw them like whatever you want—make them look very curvy, make them look very athletic, make them look like anything you want. 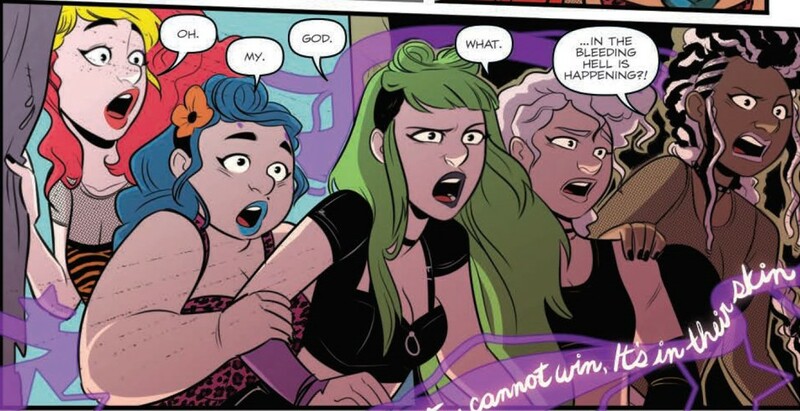 A panel from Jem and the Holograms: Infinite. Do you find there to be many differences between drawing cover art versus comic art? What is your process when working on a cover as opposed to a comic book? Cover art is significantly less time that I have to put in. In theory, I can do a cover in maybe a day or two. So, it’s pretty fast. Whereas for the interiors that I do on comics, I can maybe do a page a day of inks. And I do pencils before that. It’s very time-intensive. And I’m really bad with it because I’ll be like, every panel to me is an individual drawing, so I have to be completely happy with it. I can’t set a timer and be like, okay time’s up, let’s move on. I waste so much time getting every panel exactly how I want it. With a cover, it’s like one big panel, so it’s like a lot easier. Again, it’s kind of like being paid to do fan art, just fan art of different IPs. But I have less creative control, I guess. To me, the biggest thing is time. You’ve worked with Kelly Thompson on Jem and Nancy Drew. What has the experience been like working with her? Kelly and I just got off on a really good foot and we’ve always got along really well. I feel like she gives me a lot of creative control; she really trusts me. She’ll be like, “I’ll write this thing in the script and you just fill in all the blanks, and you know what I mean without me having to be super specific. I know whatever you make, I’ll be happy with it.” Maybe she’s just being nice. For me, I can only say that she’s probably the person that I’ve worked with who I feel like I’ve clicked with the most. Our progress is the most intuitive, where we can basically be like, here you go, your part is done and now I can do my part, and now we’re done! And we’re just really happy with each others’ work. Well, I just finished issue #5 of Nancy Drew. Issue #4 is coming out in September, in a week, and the last one comes out on Halloween. So, that’s kind of cool. I also have a book that got picked up. Me and Magdalene Vissagio, we pitched this graphic novel idea last summer—it’s like a supernatural-teen-mystery-monster story—and it got picked up by HarperCollins. So, it’s a book. We’re making a book! That’s what we’re doing now. We don’t have anything 100% concrete, but we’re talking about doing more Nancy stuff, which I’m really hoping does work out, because this is kind of Kelly and my baby. We got to make something completely new together, and people seem to like it, so that’s really awesome. I’d like to make more of it if people like it. 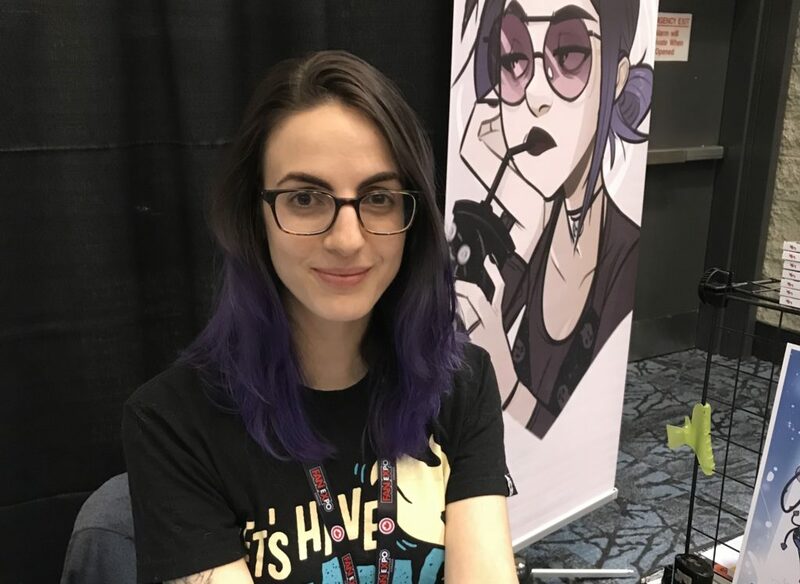 You can find Jenn St-Onge online at jennstonge.ca and Twitter as @princess_jem4.